One of the great things about living in London is that you can dress up, or dress down, and no one will really bat an eyelid. In fact, it is more than acceptable to pull together an oh-so-casual outfit, and then add a touch of glamour with heels and a designer dupe bag, and this look rocks exactly that. I built the look around my new high rise ripped jeans, adding a taupe suede top – of course- and lace up block heels (which were an absolute steal at just under £23!) to give me the height boost that I need! Distressed jeans have definitely become by everyday go-to, the easy and effortless vibe of this look is most definitely addictive for city living. 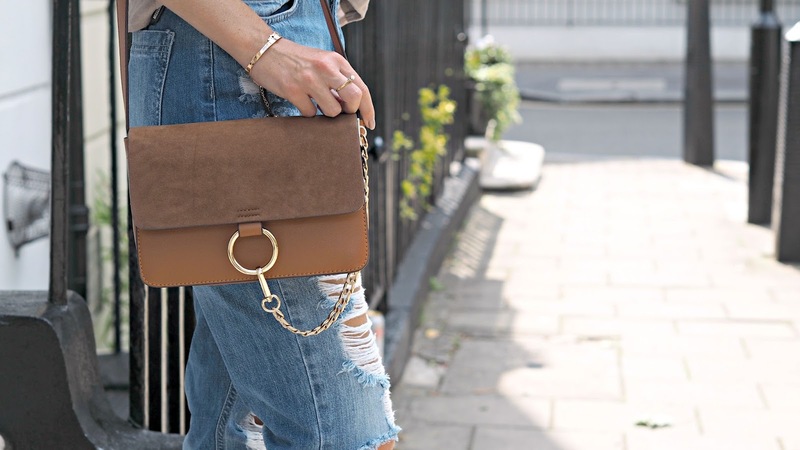 My newest Chloe dupe bag was such a steal at under £40, and is a brilliant dupe of the ‘Faye’ bag. It’s the ideal size for a day strolling the city, and the perfect shape too as it’s a cross body – absolute winner! The bag also comes in classic black and a gorgeous mink colour too. I’ve become obsessed with the new copper range from Trollbeads and this White Diamond bangle adds a gorgeous lady like touch to this look. I finished the #OOTD with my favourite accessories, so scroll down for more details and all the links!